a.) During the time when the project that became Prometheus was still in the stages of being at least one Prequel movie, it was revealed in the Alien Legacy Forums on October 29th, 2010, by a user named Necronom (which shows the person to be a Giger fan): “I’m not sure if any of this is known, but my Brother works in TV and one of the crews he works with came back from Morocco about 10 days ago (I waited until I knew it would be okay to mention). 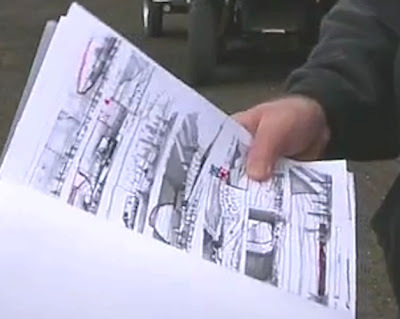 He was told that the area of desert they were shooting (where Scott shot Kingdom of Heaven) on had just been recced by Scott and he’s given the go ahead for them to start work on a pyramid! b) Financial Times on December 10th, 2010, it is supported though by an interview with Nourreddine Sail, head of the Moroccan Cinema Centre, confirmed that there would be filming in Morocco’s southern Ouarzazate film studios in February and March of 2011.
c) It was once a trailer for the film Prometheus finally came out in 2012 we firmly discover at least strange dome shaped building with an elongated head on top similar to Giger's design for the Harkonnen Castle in Jodorowsky's Dune project. Some might have guessed it earlier and some may have tried to deny the possibility because they had seen that design for some years already in the form of Giger's Harkonnen Castle painting and also Ridley's silo drawing. 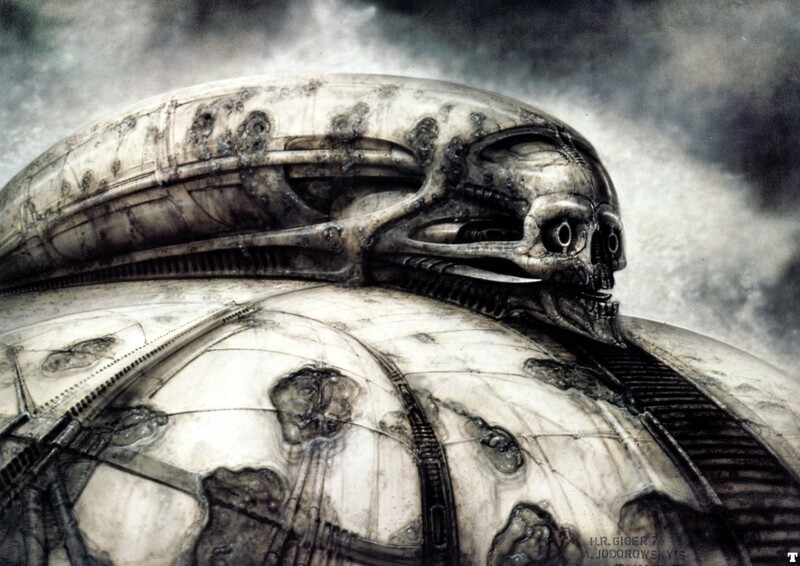 Ridley started drawing a similar image in his storyboard for an earlier version of his egg silo inspired by images fro Giger's Necronomicon for the early Alien storyboards, the images were revealed as supplementary material in the Alien DVD sets, we can see how it was loosely inspired to some extent by Giger's Harkonnen Castle that could be found in the book Giger's Necronomicon. He actually drew more than one of these "pyramid mounds" in his storyboards, there appear to be a line of them in the images shown in one of the Prometheus trailers and upon the mound he put a simple head like structure that served as an entrance and gave up the concept when Giger worked on his own, a breast shaped egg silo. 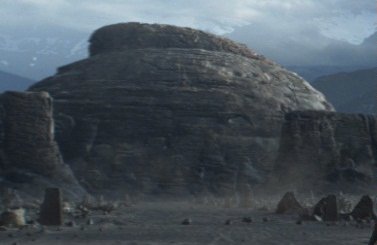 f) "When the crew of the Prometheus land on the alien planet at the core of their expedition, they find an inhospitable, barren environment and a strange, vast alien structure. 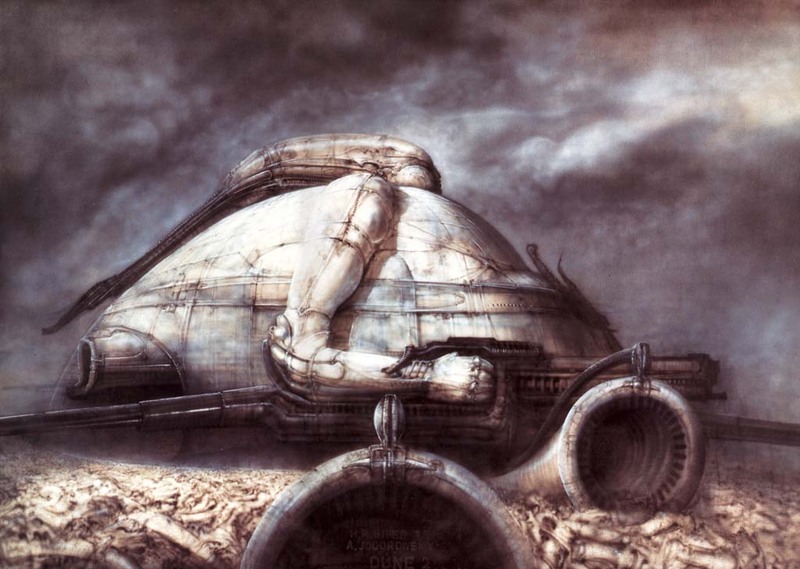 It will, assures director Ridley Scott, look like nothing we’ve seen before in science fiction, and the production went to great lengths to shoot on location in Iceland, at a location so remote that the cast, crew and equipment had to be airlifted in. g). 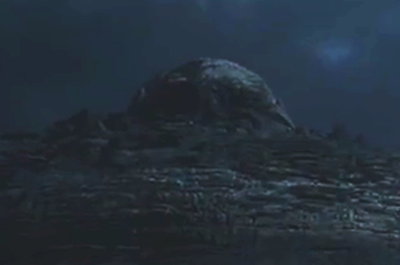 Spotlightreport also directly made the connection between the pyramid and the alien structure are revealed "Constructing the “pyramid mound” – its shape was described as a pyramid in the script, explains (Arthur) Max, but the final conception is a little different, hence the contradictory descriptor – took 16 weeks to complete with more than two hundred technicians working on it." in April 25th Featurette at trailers.apple.com. i) Ridley's Storyboard from the April 25th Featurette featuring the mound seen in the distance half way down the page. Interesting article; Moebius said ones that Star Wars and the other movies like Alien copied the idea of Dune's Jodorowsky, this is the level of the important of that project of Jodorowsky that lamentably never looked the light. Many thanks for this extraordinary post. 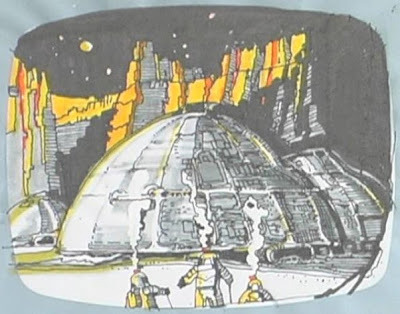 One thing about Moebius' work, it certainly seems that there were keen fans of his in the Star Wars team, and they'll have been borrowing from his work in Metal Hurlant and Heavy Metal for sure, while George Lucas can be accused of borrowing ideas from Frank Herbert's Dune. Thanks!